I’ve had a good life, a good run. 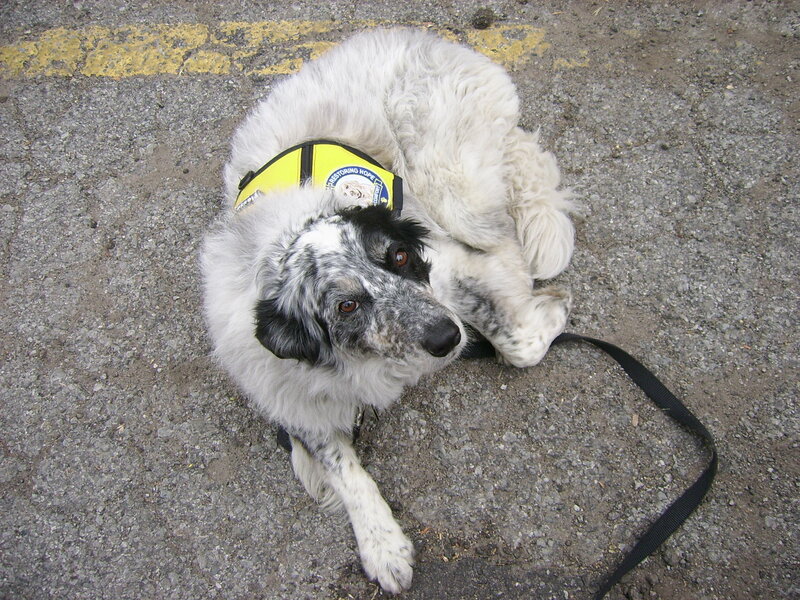 Who would imagine a rescued Border collie serving with three Therapy Dog organizations, being invited to play a key role a children’s TV show episode, featured in several newspaper articles, Frisbee competitions, being a diplomat for Great Lakes Border Collie Rescue…AND going bye-bye in the car!? The second organization I worked with was THE EXTRA MILE MINISTRIES (www.faceofcrisis.org). My Dad had read about their service at Northern Illinois University…after the shootings in February 2008. They checked me out, tested my personality, my behavior around other dogs, people, children…I like everyone. Just don’t try to mount be from behind…that will turn into a teaching moment. The K9 Crisis team returned to NIU in February of 2009 for the one year memorial and the candlelight vigil, and I was a member of the team. Yes, you’re right…several Golden Retrievers (they’re sooooooooo laid back), a pointer, a beagle, a black mixed-breed, and me – the only Border collie. We were all, very COOL. Yellow vests, well-behaved, and we all got a lot of attention from the students. That Saturday had been a long day and by the time the Candlelight Vigil had ended, I was the only dog left. My Dad brought me into the Student Center and I collapsed on the cool, terrazzo floor…I was laying on my side, stretched out, time for a nap! The students and family members slowly made their way from the candle lit plaza into the warmth and quiet of the Student Center. My Dad had stepped away from me, I’m sleeping, I’m a good boy, I am always calm, cool, collected. Even though my eyes are closed and I am still, my senses are always working…my sense of smell, my hearing, my intuition, are always processing…I am always thinking, aware of my surroundings, odors, smells, vibrations, aware of another’s presence. There is no noiseless environment, even in sleep. I knew, I sensed, that the chilled grievers, returning from the vigil were approaching me, forming a circle around me, touching me, petting me, speaking softly to me. There is no need to open my eyes. There is no need to move. I know in my heart that the humans encircling me are sad. I smell tears. My presence, my stillness, my acceptance of their touch provides them with all that they need…at that moment. This morning, My Dad and I were out for the second walk of the day. A new maintenance guy, Tom, for Village Green, pulled up in his older, gray, rusty Jeep Cherokee. I was sitting on the sidewalk, off leash. When Tom turned off his engine, I slowly stood up and walked over to his driver’s door. “Hey, I’m Cody, I’m cool, its OK, to pet me – just do it.” And he did, he reached out right away, no hesitation. He petted me, rubbed my head. “He’s really a good dog,” Tom said from his Jeep. “He’s a retired Therapy Dog,” My Dad said proudly. This entry was tagged border collie, border collie rescue, life with a dog, old dogs, rescued dog, therapy dog. Bookmark the permalink. Hi Cody. Your story about NIU brought tears to my eyes. You are kinder than the vast majority of people I know. And frankly, you’ll never really be retired as a therapy dog because you bring c alm and affection wherever you go. Hi Cody! My mom said: “Today, let’s read Cody’s blog!” I never realized how chatty you are. You always seem to be in such a hurry to leave when I show up. Or you just move away and sit there silently. I just thought you were shy. Maybe just around me? Anyway, we really loved your stories, but this one about your work with the NIU folks really moved us. My mom even posted on her FB timeline. We’ll keep checking in, now that I know what a deep thinker of thoughts you are!!! Your friend, Livvie.